Oddly, we managed to sleep beneath our mozzie net in our fan-assisted oven. We didn’t have to sleep too long because we had yet another 0-dark-30 start, our alarm being set for 04:15. Had there been tea in the tent it would have been 04:00 but we had a 15-minute lie in. Why the rush? Well, we were off on a morning game drive in Udawalawe National Park. Here’s what happens. The park opens its gates at 06:00. 30 4x4s are allowed in at 06:00 then others have to wait an hour before any more can enter. Naturally everyone wants to be in early for the sunrise activity so a queue/melee starts forming much earlier at the gates. So, you really need to be up near the front or risk twiddling your thumbs outside for another hour. It’s about a 20-minute from Athgira River Camp, where we had overnighted, hence our leader wanting to leave at 05:00. Thus, a 04:15 alarm. We drove out in two 4x4s. The 4×4 I was in drove back again to retrieve my hat which had managed to escape between the cab and the back seating area. [Who thought the back was attached to the front but couldn’t see in the dark, then?] Hat safely retrieved, we tried again and this time made it to the line of early bird jeeps already queuing at the gate. The gates finally opened and the melee began. If you’ve never seen a melee of 4x4s it’s a sight to behold. Jeeps get thrown into reverse, then a forward gear before swinging out trying to manoeuver nearer the front. Other queue jumping jeeps appear from the far side of the road coming and look as if they are set to T-bone a less attentive driver. The crush of vehicles thus created somehow funnels down to get through the gate. It’s like a stock car race, happily without any contact, though I wouldn’t like to swear that there was never any contact. We got through the gate. Great, we’re in, I thought. Wrong. What we’d fought so hard to get through was the outer gate. Now our driver screeched into a parking spot on the far side of the track in sight of a building on our left. It was as if the squadron scramble bell had been rung. Our driver’s door was flung open, he jumped out and ran towards what I now realized was a ticket office. Every other driver from the jeep melee was doing exactly the same. This was the Olympic Game Park Sprint. Our man eventually sprinted back triumphantly and were off to get through the inner gate and into the park itself. I can’t help but say that this crush and rush felt an unseemly affair: homo sapiens looking far from sapient and more like a ravenous beast. Actually, the beasts look much more dignified by comparison. The fact is, though, that without such tourism there wouldn’t be the incentive for countries to preserve their wildlife and wild spaces. Yala National Park is reportedly much worse with many dozens of vehicles descending on sightings as word spreads via modern communications. 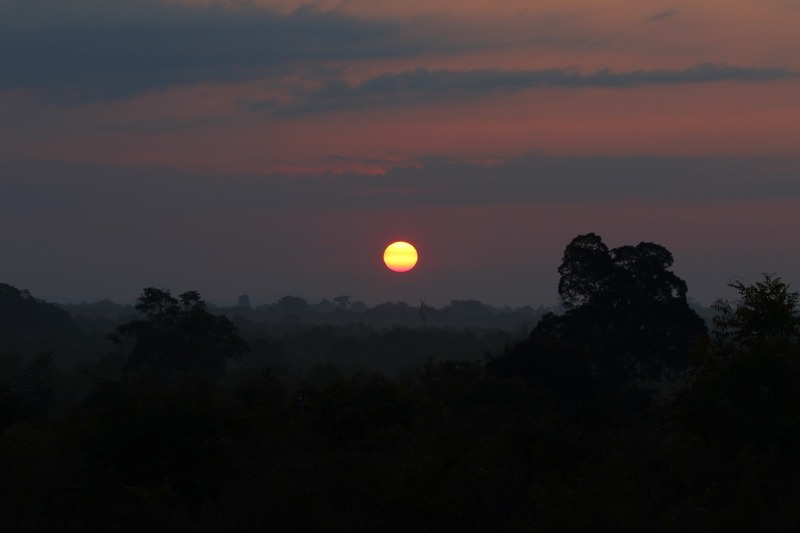 In any event, we were in and the sun rose over Udawalawe. This is where the Transit Home elephants re-join the wild population. The park itself is not an open savannah – at least, we didn’t see any – but a series of dirt tracks lined with quite thick, though not dreadfully high, bush. We were very soon seeing elephants. In fact, elephants appeared to be pretty much everywhere. Because of the terrain, there is rarely an unobstructed view of a subject which is usually lurking behind at least some vegetation. 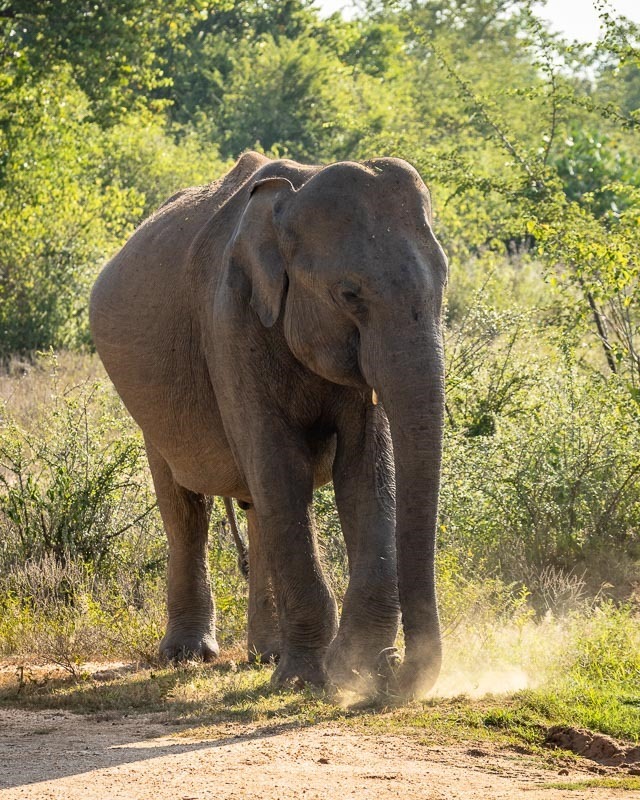 Probably because many, if not all of the elephants are accustomed to humans, there are frequent occasions when they get very close to the vehicles out on the tracks. As usual, there were lots of mobile phones snapping away. For once, they were in close enough proximity to be useful. 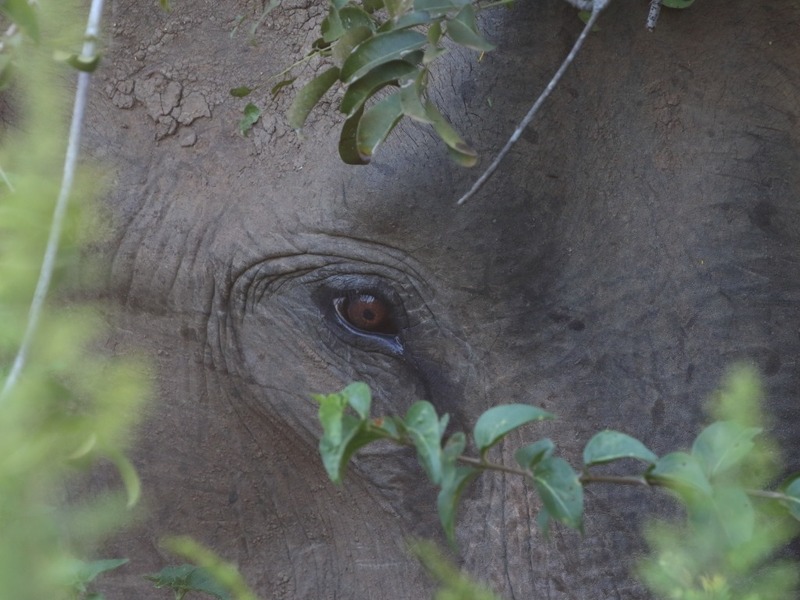 We came across one elephant kicking up moss-like vegetation and gathering it with its trunk. It looked like a lot of work for little return so I hope it was tasty. 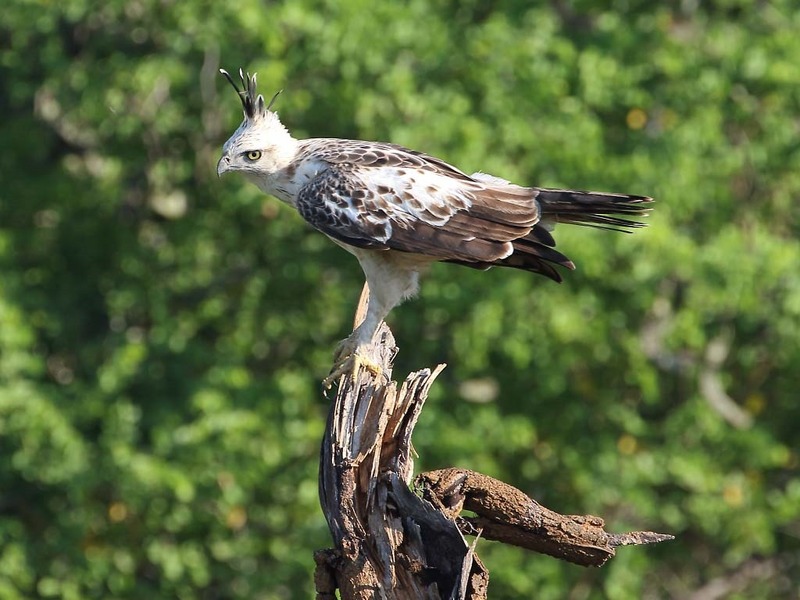 The game drive was much more of an elephant drive, though we did see a smattering of Water Buffalo and an impressive Changeable Hawk-eagle (Nisaetus cirrhatus). We headed back out of the park for breakfast and a drive to Koggala on the southern coast of Sri Lanka. Here, we had an appointment with the well known stilt fishermen. There was a little not necessarily welcome excitement en route. We’d called in to a neat looking establishment on the coast for lunch and wandered to a table out the back. A menu sat on the table and we set about ordering. When the bills came our resident pro photographer noticed a discrepancy. He’d ordered a dish that had been priced at 450/- in the menu we’d seen but seemed to be being charged 790/-. The waiter returned with another menu in which the dish was, indeed, priced at 790/-. I heard local and tourist being muttered. Yes, there was one menu with prices for locals and another with prices for tourists. A protracted argument ensued and we all ended up paying the local prices. OK, I suppose it’s no surprise that this practice goes on but one doesn’t want it to be quite so blatant. Our leader, who was a local, was dragged away from almost coming to blows with the manager. Calm was restored and we checked in without further mishap to our accommodation at the Koggala Beach Hotel. 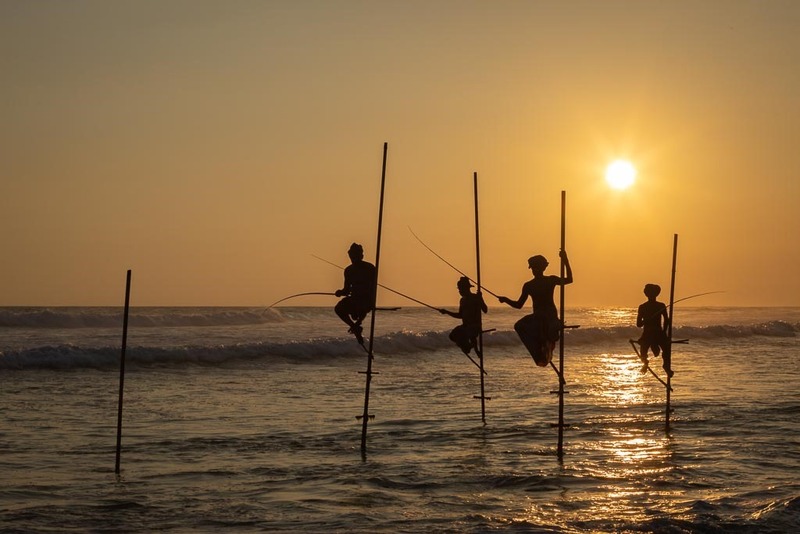 This area is one of the better places to photograph the famous stilt fishermen (though I noticed that it was more often translated as stick fishermen on many of the signs). There are many series of posts erected in the surf, the posts come complete with a rudimentary and rather uncomfortable looking seat. 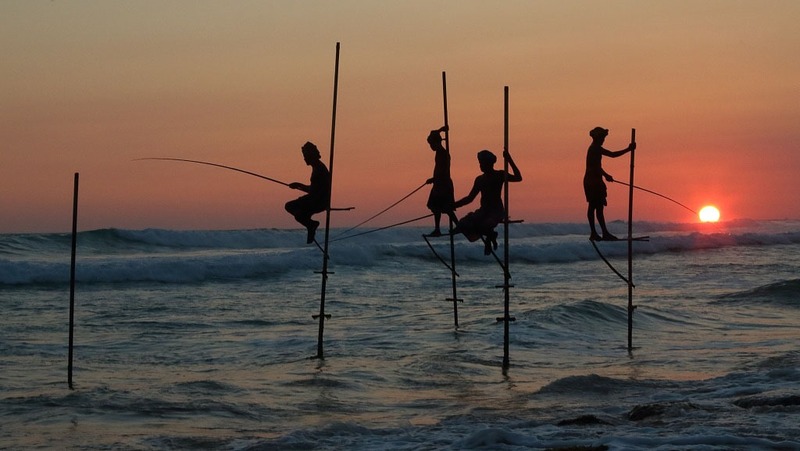 The fishermen, armed with their fishing rods, clamber up these “stilts” and sit, fishing. We had dropped off our leader and resident pro to go and scout locations and make arrangements for what would hopefully be an atmospheric sunset shoot. As shadows lengthened and sunset approached, we were driven back to the chosen location. The clear shot (without rocks creeping into our background), was looking west so this would be a silhouette situation. Were you to try this at sunrise, illuminated fishermen would be possible. Our models had been paid to pose on the stilts and do their thing. After we chose our respective vantage points and planted tripods in the sand, the fishermen took up their positions. Incidentally, tripods can be quite a problem in sand, especially wet sand – they tend to sink in when a hefty camera and lens is placed on top. Seven cameras clicked away furiously with our leaders having a go, too. I resorted to hand held shots to try a few different angles more readily. Here’s one Francine likes with the sun a little higher and what I think is my favourite with the sun touching the horizon. Dinner in the hotel was hot and quite noisy, it apparently being another establishment that thinks live music is an aid to digestion. The trio of wandering minstrels happily did not come and pause at our table, though.